Wellesley horticulturists David Sommers and Tony Antonucci got a big surprise recently when a small Mediterranean gecko jumped out of a plant debris barrel they were moving in the Tropical House, one of 16 glass houses that comprise the Margaret C. Ferguson Greenhouses. Sommers, an animal lover and avid photographer, scooped up the lizard—which is probably a baby—and placed it in a glass vase for an impromptu photo shoot. 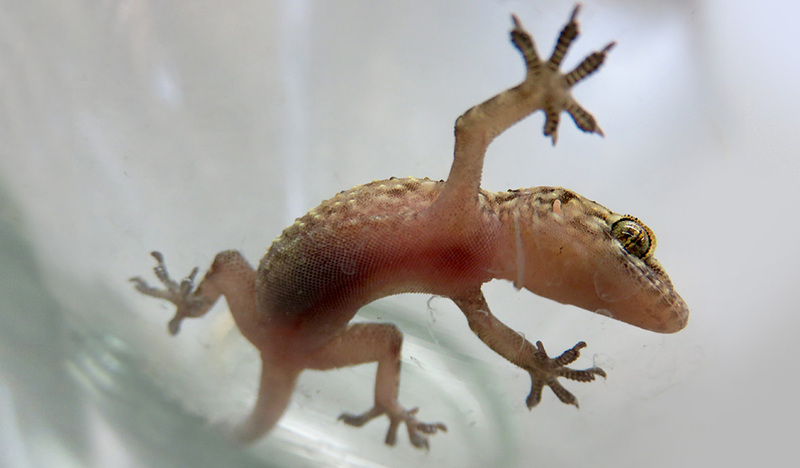 "No one knows how many geckos there are in the greenhouses, or when they first arrived—at least 15 years ago," said Gail Kahn, assistant director of the Wellesley College Botanic Gardens. Geckos are nocturnal, so staff and visitors rarely see them. "They could hang out in nooks and crannies or run along the steam tunnels. This is a fun place for them," said Kahn. "We enjoy spotting them because they’re an indicator species for the health of our greenhouses. It demonstrates that we've created a mini tropical habitat in which they have a home." In addition to having photogenic good looks, geckos also perform an important function by eating uninvited insects, such as crickets, that take up residence in the lush surroundings. "At night, the place is alive with crickets singing," said Kahn. "The geckos are an important part of our pest-management approach because they help keep all of our little visitors in balance." The Global Flora project to re-envision and reconstruct the five major houses of the Ferguson Greenhouse complex, including the Tropical House, will occur at the same time as the planned Science Center renovations. "I hope the geckos will hang in there to be part of Global Flora because they are so important to our greenhouse environment," said Kahn. After taking a few photos, Sommers released the little lizard. "I think he's better-looking than the gecko in those TV commercials, and he doesn’t try to sell insurance," Kahn said.